Imagine you are the principal of a high school in the USA. 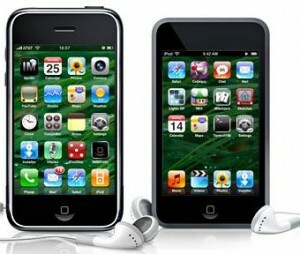 Students are constantly bringing their mobile phones and iPods to school. Last year you banned these devices from the premises. Parents and teachers supported you in this. Bags are searched at the school gates every day, and any mobile phones or iPods that are found are confiscated. But the kids keep finding ways to sneak them into class. Now teachers are complaining about the amount of time and effort they spend punishing the kids, confiscating their devices, and reporting them to their parents. And still the kids come to school with their mobile phones and iPods. What do you do? This is the situation that Edward Spurke, the Principal of Roswell High in Georgia USA, found himself in last year. What he decided to do was to stop fighting a losing battle, and to persuade teachers and parents to embrace mobile technology in the school (the kids needed no persuading). There is no point fighting a losing battle. Kids are already bringing mobile devices to class — find ways to embrace the technology, not suppress it. Investing in class sets of one device (e.g. iTouches, or netbooks) ensures that everybody can use the same software and apps on the same machines. Using devices with no inbuilt cameras or sms/telephone facilities will avoid kids constantly taking photos during class, or needing expensive phone data plans. You can allow students to take home the mobile devices. But get students and parents to sign a liability form to deal with lost, stolen or damaged devices first. Make the entire school building WiFi, and forget website blocking software — the kids will find a way around it. Instead ensure that you have an Acceptable Use Policy in place. Ensure constant free access to the WiFi in your building — kids will then use their mobile devices e.g. during lunch and their free time. On the K-Nect project, when asked what sorts of technology students would like to see in the classroom, 90% of them preferred mobile devices. On the K-Nect project, students also wanted access to social networking facilities such as blogs and instant messages on the devices. What is particularly interesting about the use of mobile devices for the K-Nect project is how students used these social networking facilities to help each other problem solve. Also, they generally spent a lot more time on mobile-enabled schoolwork than they had done previously (and we are talking about algebra and maths!). Also interesting are the research results for this project, which showed higher test scores in maths for the classes that used the mobile devices and mobile-enabled materials, as opposed to classes who use traditional methods and content. Listen to the recording of the Education Week webinar. Listen to podcasts produced by the Roswell High student is with their mobile devices on the school website. Find out more about the K-Nect project on their website and blog (some interesting videos on the blog) . Read about other case studies in mobile learning. For the private language schools sector, Nik Peachey has a good blog post about why all schools should have free wifi. Any more pointers to specific mobile case studies, or anecdotes and suggestions welcome! It’s really interesting and amazing.It means that we teachers of the 21st century should adapt to the development of modern technology and use all ranges of technology in the classroom.I believe,at least, they will not replace teachers. Hi Malahat, and thanks for your comment. I certainly agree with you that technology will not replace teachers. You’ve probably heard that famous quote: “Technology will not replace teachers but teachers who use technology will probably replace teachers who do not”- Ray Clifford. I think that’s probably true!